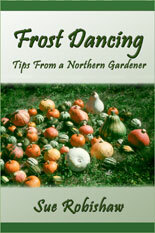 End-of-summer gardening is a hectic time of harvesting, preserving, and enjoying the fruits of your many labors. But as the final vegetables are gleaned from the ground, it’s also a great time to think about doing a bit of work now that you, and your garden, will appreciate in the spring. Turn your flat bed garden into a raised bed oasis -- make yourself and your garden some permanent garden beds. If you already have raised beds, then you’ll know what I’m talking about. If you don’t, I think you are in for a pleasant surprise at the benefits. There is a myth that it’s much easier and faster to get out that roaring tiller or tractor and take care of the entire garden at once. That may be, but having done it both ways, I don’t think so. Not in the long run. And I’ve discovered that doing things for the short run almost always means a lot more work, and time, later. As much as I love gardening, and the time I spend growing food is not begrudged in any way, there are many other things I want to do as well. So I have permanent raised beds. One of the best aspects of permanent beds is, to me, psychological not physical. Instead of being confronted with a big expanse of ground that needs to be planted (or weeded or tended or harvested), I can easily take it one bed at a time. Thinking about weeding one bed is a whole lot less work for the brain than thinking about weeding the entire garden. It’s surprising the difference that makes. Rather like the satisfaction of a good conversation with one person, instead of the chaos of talking with ten people at the same time. 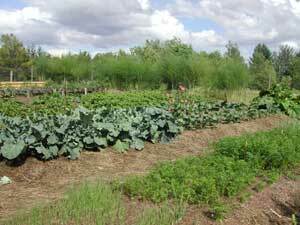 Having your rows consolidated into regular (or irregular) plots or beds, with paths between the beds instead of between every row, means more of your garden will be involved in growing food, instead of weeds. There will also be less compacted soil for the roots and beneficial organisms to deal with. And when you add your scarce and valuable compost, it’s easy to put it where the plants will be, not be wasted on walking paths. Isn’t it easier to till weeds than pull them out by hand? 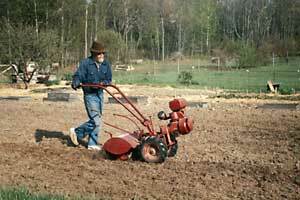 If you have sod or a massive plot of weedy ground, it probably is easier to till or plow it in. To begin with. And depending on the weed plant. Funny thing about weeds is (well, it’s only humorous when you’re in a particularly good mood), many of them thrive on being chopped up. That’s just a good excuse to propagate and spread. But I don’t think they really have anything against being pulled up root and all to rot and compost on top of the soil. It’s all a part of the game. Usually I go over the beds before planting in the spring, then once again mid-summer, and that pretty much takes care of things -- along with the natural pulling of weeds as I harvest or walk through the garden. Unless there is a bad infestation of something, this is a here and there kind of thing. My beds are never completely weed-free, but they are a background, not the foremost thing in the garden. And they are a natural part of the community. Weeding gets you down in personal contact with that community, and when it’s not overwhelming, this can be an enjoyable relationship. You can have permanent beds without having raised beds, of course, but I find the small rise makes it easier on the body when tending to the things on the ground. So I make raised beds, the top of the bed being maybe six or eight inches higher than the paths. It varies year to year and bed to bed. And one side of my beds is higher than the other since the land is on a gentle slope with the beds laid out across the slight hill like small terraces. I like to make new beds in the autumn, which gives them the winter to settle in. But you can make them anytime you can work in the garden, one plot at a time, or a portion of the garden, or the whole nine yards -- whatever suits your personal gardening schedule. 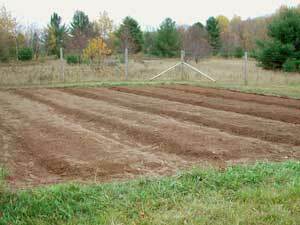 If it’s new ground, I give it at least one season of growing and tilling in green manure. If it is an established garden, till it one last time when everything has been harvested. 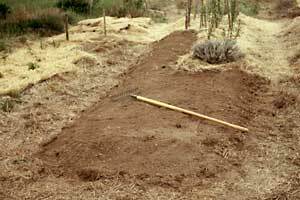 You can made beds without tilling the ground first, but it does make it easier. Once the area is worked up, string line every 3 1/2 feet where you want your beds to be. If your land slopes, go across the hill to help prevent washouts running down hill down your beds. Though if you mulch and your soil is well endowed with organic matter, this isn’t going to be much of a problem unless your slope is fairly steep. Depending on the shape of your garden, and personal preference, you’ll want a path or two running up and down across the rows. Mark where those paths will be as well. After many years and various configurations, most of my beds ended up being about 30 feet long. Any longer without a cross path and you’ll end up walking across the bed anyway for convenience. You might as well make a designated path. Now go down every other wide row (which will be the beds) with a garden fork, loosening up the soil as far down as your fork will go, going backwards down the row so you aren’t walking on the soil once you’ve loosened it. Tillers (and plows) are notorious for making a firm, compacted plow-pan just under the tines. The plant roots will appreciate your breaking this up a bit. I’m not talking about double digging or anything so drastic and disruptive. Just push your fork down as far as it will go and pull back to loosen up that plow-pan. Then continue across and down the bed. It doesn’t take that long once you get a rhythm going, though for muscle sake, you might want to spread this chore over a number of days if your garden is very large. Then go down the adjacent path shoveling soil onto the bed. You don’t need to dig down, just skim off the top loose soil. 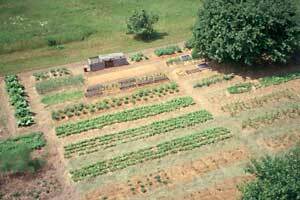 If you want higher raised beds, take more; for shorter beds, take less. Or if you don’t want raised beds at all, skip this step. Just keep the paths/beds marked until it is obvious which is which. Just by walking only in the paths and not in the beds, the growing area will be slightly higher naturally. Take the strings down and flatten the beds with the back side of a garden rake (or whatever works best for you). The formed beds will end up being about four feet wide on top, and the paths about 2 feet (the other foot being the sloped sides of the bed). I’ve found this to be a convenient reach for working in the beds, with enough room for walking and running the wheelbarrow in the paths. If you want more or less, adjust your strings appropriately before you start making the beds. If I did it again I'd make my paths narrower but this arrangement does give you comfortable room to maneuver. Since the soil has been unnaturally aerated and fluffed with all this digging and moving, you’ll want to let it settle back to normal before planting. If this is a fall project, cover with a blanket of mulch and it will be all set to plant in the spring. If you're doing it in spring or summer take a piece of plywood or such and work it on down the plot, stepping on the plywood as you go to gently tamp the dirt down. In the raised bed crowd there are the permanent sided folks, and the natural sided folks. They both have their pros and cons. I’ve found the natural dirt sides to suit me best. It allows for the most flexibility in moving and changing beds, and is the easiest. I can rake the beds to whatever widths I want -- narrower for tomatoes, wider for peas. I can easily (and have a number of times) change the layout and length of my beds, moving paths, adding or taking out trees or shrubs, making the garden larger, and smaller. I guess I’m not a very static person, and my garden reflects that. However, those who put in permanent sides, whether wood planks or beams or stone walls, like them as well. Suit yourself. Try it both ways. If you have trouble physically kneeling or sitting on the ground to work among the plants, then a firm wall you can sit on could be a great help. You can make it as high as you need. Paths can be made wide to accommodate wheelchairs or walkers. Gardening is wonderfully adaptable. Wide or narrow, mulched or naked, one thing most paths have in common is weeds. In general my entire garden is mulched, including the paths. So weeds aren’t an overwhelming problem, unless I’m short of mulch. I try to make it a point to weed the nearby path whenever I’m weeding the bed. If I don’t, I tend to ignore the paths. If they get particularly weedy, I rake the mulch off (up onto the sides or top of the adjacent bed) and spend some time with the hoe. Then I remulch before the weeds have a chance to take over again. Pulling by hand works best, however, with a sturdy trowel or knife for the stubborn ones. If you do it after a nice rain when the soil is moist it's easier. You can also till your paths. But that makes a mess, and then you have to rake it flat several times or it gets pretty lumpy from your footfalls in the loose dirt. Mulch is so much more pleasant and easy. Another advantage to permanent beds is being able to easily leave areas undisturbed for various crops. You can have a bed of strawberries in your garden. You can plant your garlic in the fall when it is convenient, without working around the fall tilling or plowing schedule. You can let certain plants (such as dill, or chamomile, or seed plants) self-sow, to grow new plants in the spring without your having to plant the seed. You can put a permanent herb bed right in the middle of your vegetable garden if you want. Or a bed of raspberries, or blueberries. Maybe a flower bed. Maybe a fountain! Permanent beds require a different perspective and planning than the tilled garden, but if you allow yourself that change of view I think you’ll enjoy the scenery. It’s one step closer to Nature’s permaculture, and a very satisfying way to garden.